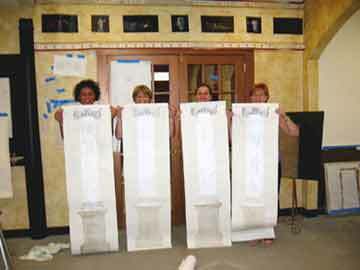 “INSIDE THE ARTIST’S STUDIO” trompe l’oeil classes are held at the FAUX DESIGN STUDIO Addison, IL. Course highlights include rendering Ionic CAPITAL, white veined marble COLUMN, cement BALUSTERS and BALSTRADE. Instruction is given in both aerial and linear perspective, color harmony and correct brush choice.